Apartments built in the 1970s lease for 42% less on average than apartments built in this decade and an estimated 29,051 apartments in the Denver metro area rent for $1,000 or less. Average rents in Denver fell by $19 per month in the third quarter of 2018, continuing a three-year trend in rent decreases during the third quarter, according to the Denver Metro Area Apartment Vacancy and Rent survey published today. “Average rents fell 1.3% to $1,465 during the third quarter, down from $1,484 during the second quarter,” said Mark Williams, executive vice president of the Apartment Association of Metro Denver (AAMD). During the same period, inflation, referring to the general increase in the price of all goods and services, hit 0.5% in Denver, according to the Bureau of Labor Statistics’ Consumer Price Index for the West Region. Adjusting for inflation, rents fell by 1.8% over the last quarter. Over the past year, average rents increased by 3.8%, which Williams notes is just 0.4% above inflation over that same period. Average rents reached $1,412 during third quarter of 2017 and the Consumer Price Index for the West Region increased by 3.4% over the last 12 months. Historically, rents tend to rise during the third quarter due to dwindling supply in summer months as well as increased household formation is at its highest. During May through September, 18-year olds graduate from high school and 22-year olds graduate from college and many marry during summer months. According to the report, average rents for the metro area increased the third quarter during 28 of the past 37 years. However, 2018 marks the third consecutive year of third-quarter declines, likely due to seasonal effects and a pronounced slowdown in construction. “For average rents to decrease in the third quarter is unusual. For them to drop in the third quarter for three consecutive years is exceptional,” said Teo Nicolais, a Harvard Extension School instructor who specializes in real estate. “Developers today face labor shortages, higher construction costs, and tighter lending standards, which are putting the brakes on new apartment supply. The only other time Denver recorded three consecutive years of third-quarter rent declines, Ronald Reagan was President and average rents in the city were $396. The only other three-year streak occurred when third-quarter rents decreased by 0.4% in 1986, 1.1% in 1987, and 1.0% in 1988. Following a more typical trend, the average vacancy rate for the Denver metro area decreased slightly to 5.5% in the third quarter of 2018, down from 6.0% three months earlier. According to the report, the average vacancy rate decreased during the third quarter in 29 out of the last 37 years. Nicolais noted the 2,570 new apartments built during the third quarter of 2018 represents a 40% drop from the same quarter last year, during which 4,315 new apartments were built. Quarter-over-quarter construction levels also fell 25% from second quarter of 2018 during which 3,435 units were built. Nonetheless, the more than 41,600 new apartments added in the last four years have eased what has been a tight rental market. “Average vacancy rates, which hit 3.9% in the third quarter of 2014 have increased for every third quarter since then,” said Williams. 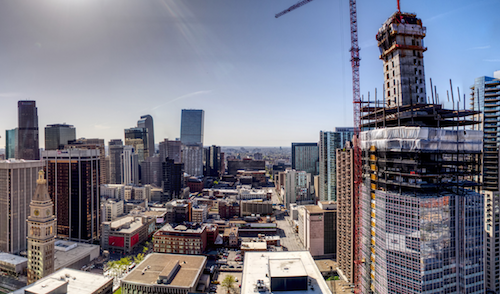 “This report shows an unmistakable trend toward Denver’s normal vacancy rate of 6.1% for the third quarter,” said Williams. “As expected, apartments built in 2010 or later topped the list with average rents of $1,847. Apartments built in the 1970’s rented for an average of $1,171 or 42% less than apartments built in this decade,” said Williams. While rents have increased throughout the city in recent years, affordable housing can still be found. The report found 10,580 apartments in the Denver metro area that rented for $1,000 or less. Based on the survey’s sampling of 125,654 apartments there are over 29,000 apartments in Denver that charge rents of $1,000 or less. Commerce City/Brighton, Aurora-Central South East, and Longmont tied for the lowest average vacancy rate of 2.8%. The Denver Metro Area Apartment Vacancy and Rent Report is coordinated and published by the Apartment Association of Metro Denver. The survey is conducted by the University of Denver’s Daniels College of Business and Colorado Economic and Management Associates, and is sponsored by The Colorado Department of Housing.